Where is Golden Palm Las Vegas? Click here for detailed Map Click here for Distances from Golden Palm to popular Las Vegas Attractions. Golden Palm Hotel Casino is easy to get to. Once you are here at Golden Palm Vegas it is easy to get around. Just minutes from the heart of the Las Vegas Strip. Golden Palm Vegas is your gateway to adventure! 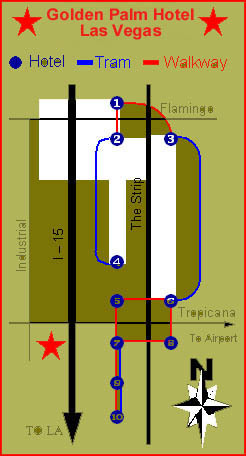 Click here for Las Vegas Strip map . North - Highway 93 or 95 to I-15. Exit I-15 on Tropicana Ave. exit. Use far Right lane, turn right onto Tropicana. 1st light make left onto Industrial Rd. Enter Golden Palm Hotel Casino from Industrial Rd. South - Exit I-15 on Tropicana Ave. exit. Use far Left lane, turn left onto Tropicana. 2nd light make left onto Industrial Rd. Enter Golden Palm Hotel Casino from Industial Rd. East - Highway 93/95 to Tropicana Ave. exit. Turn left and stay on Tropicana 7 miles. Pass through Las Vegas Blvd (the strip). Over I-15 and make a left onto Industrial Rd. Enter Golden Palm Hotel Casino from Industrial Rd. West - Highway 95 to I-15. Exit I-15 on Tropicana Ave. exit. Use far Right lane, turn right onto Tropicana. 1st light make left onto Industrial Rd. Enter Golden Palm Hotel Casino from Industrial Rd. Click here for Las Vegas Strip map . Golden Palm Vegas welcomes you! Our location is what Golden Palm Vegas has! visit Las Vegas every month. visit Las Vegas every year.